3. The job of managing the perception of others in how you perform your job. 3. The creation of the impression of performance to others. These two auxiliary jobs – or “phantom jobs” as I like to call them – create a lot more work for the employee. The moment the employee receives some feedback related to either of these two phantom jobs, the employee is more likely to stop doing the first job, and focus on resolving the second two. The problem is that these second two jobs are ill-defined, and a lot of effort can go into improving the boss’s impression of the employee and the impression of what others think. The likelihood that the individual employee can change these impressions and perceptions is actually quite low. But the feedback requires that employee make this effort nonetheless. Managing perceptions is not only hard, it’s impossible and frustrating. And it takes away from the energy of doing the job itself. Yet many managers seem highly focused on the “perceptions” that an employee creates, and start trying to help by providing feedback on these perceptions. This sends the employee in an impossible cycle of trying resolve something that is not able to be resolved. 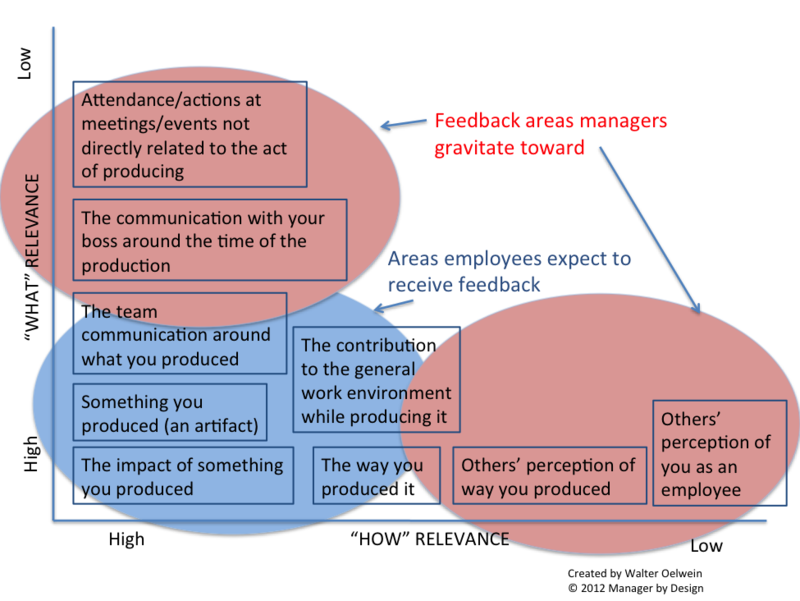 Managers can actually help by stop worrying about and commenting on perceptions and instead start focusing on feedback related to the artifacts the employee’s job is expected to produce, and the actions taken (more info here and here) to create the artifacts. This makes the feedback more job-related, and if the job outputs are improved, the manager will be pleasantly surprised that “perceptions” are largely irrelevant and perhaps contradictory to what the employee is doing on the job. Do you have a manager who likes to manage to perceptions? Has this made you better at what you do? Have you had a manager who willfully ignores perceptions and focuses on job output and the methods taken to produce that output? Which do you prefer?